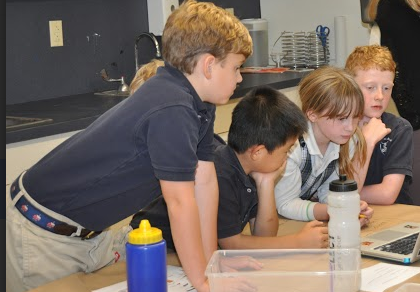 Second and third grade Students at The Stanwich School in Greenwich, CT watch an educational video about ground water to prepare them for making an aquifer of their own. LUV has set up a simple, yet comprehensive training system to benefit YOU, so take your time moving through the training modules. The more prep time you put into the training process before the course commences, the less prep time you’ll spend before each class. Also, students will gain a certain respect for you if you show them the cool STEAM project you already made before they embark on making their own. In addition, you’ll be able to troubleshoot anything and everything in the classroom, you’ll have more time to devote to differentiating for your class, and the students will be inspired by your example. I am a firm believer in “there is no such thing as a dumb question.” The goal is to create an environment where students are comfortable speaking up, asking questions, challenging assumptions, etc. If you set a tone where student inquiry is expected and supported, your students will thrive. Educators everywhere have been talking about helping students develop a “growth mindset” – the idea that kids can develop their abilities through dedication and hard work. LUV courses provide the opportunity for teachers and students to do just that, and then some. Making an aquifer is one of many hands-on activities in LUV’s Global Scientists course, which explores the chemical properties of water, the water cycle and filtration so students can understand how water systems can be polluted and purified. This famous quote from Mahatma Ghandi is one to live by. You have the power to inspire authentic global citizenship in the children taking your LUV course. Each week offers a new opportunity to facilitate a conversation about cultural similarities and differences with input from the kids’ global partners. Allow your students time to break down any preconceived notions or stereotypes they may have about people from other cultures and religions. Let them see for themselves that they have more in common than they realize and much to learn from one another. Keep your students entertained with exercises. When you start your training, you will receive LUV’s fully developed curriculum and a virtual student workbook. There are countless of activities in each LUV curriculum, enough to keep your students engaged and hungry for more. Help students realize their full potential by encouraging them to uncover their hidden talents in Scratch, SketchUp, etc. The abundance of activities to pull from will help you create a more flexible learning environment in your classroom. The most difficult part is deciding which exercises to skip! 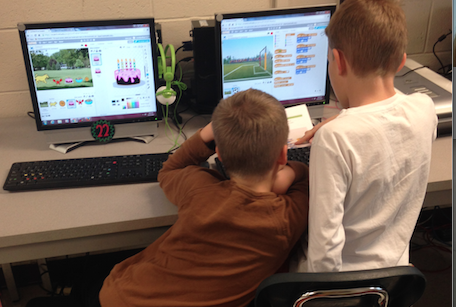 These boys are coding with Scratch and exchanging ideas with their global partners in LUV’s Global Video Game Designers. Guide students along a path that give them the chance to make meaningful connections to previous course content. Each class is a journey to discover new possibilities and grow the web of information inside each student’s mind. Then provide students with the sun, nutrients, and water. Their “Ah ha” moments are the blossoming buds of connections. As students talk to their global partner about what they learned in class, they can share these epiphanies and find out which aspects of the lesson intrigued their partner, as well. 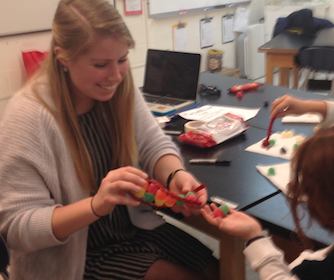 Nicki helps students build models of the double helix using candy in Global Doctors: DNA at The Stanwich School in Greenwich, CT.
To bring Level Up Village courses to your school, visit our contact page to get started and be sure to tell us if you have a particular global partner in mind for your students’ collaboration.